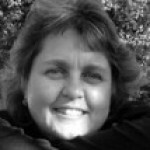 What do scientists think about coastal sciences education & outreach? Are they engaged? And, in what ways are they contributing? This report offers answers to those questions. 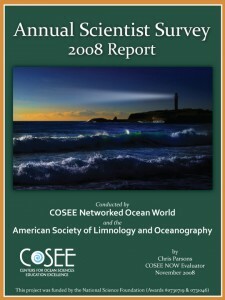 Since 2004 COSEE NOW (formerly as COSEE Mid-Atlantic) has conducted an annual online scientist survey to gather data on the education involvement, practices and needs of scientists at current and future ocean observing systems. Our goal is to improve the exchange of data and teaching practices between scientists and educators. In 2008 we partnered with the American Society of Limnology and Oceanography (ASLO) and included their members in this year’s survey (we thank ASLO for their assistance). Anyone planning education programs or products, establishing partnerships among scientists and educators, or interested in improving their education and outreach activities will find this report interesting and useful. We also welcome your comments.